Home > Heavy Duty V Belts > V-Belts. A, B, and C Sections. Standard and Kelvar Construction > Classical B Section 21/32 inch (.66") Wide. Classical V-Belts. > B66 Power King V Belt. Classical B66 Industrial V-Belt. > BX66 Power King V Belt. COGGED BX66 Industrial V-Belt. > B66-KC Ultrapower V Belt. Kevlar B66 Industrial V-Belt. B66KC Ultrapower V Belt. Kevlar B66 Industrial V-Belt. 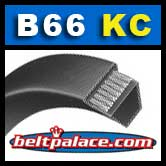 B66-KC Ultrapower V Belt. Kevlar B66 Industrial V-Belt. 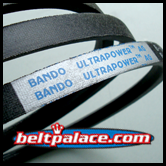 B66KC BANDO ULTRAPOWER AG Belt. Kevlar B66 Industrial V-Belt (B66K). B Section = 21/32” (5/8”) Wide x 69” Length OC (16mm x 1753mm). Features superior “clutching” Aramid (Kevlar) fiber cover for high durability and extra long service life. Heat and oil resistant. Excellent for home and commercial lawn & garden machines! NAPA, Grainger, PIX (low grade) B66. MTD 754-0145, MTD 754-0195, MTD 754-0329, MTD 754-0329A, MTD 75400329, MTD 954-0145A, MTD 954-0329A. Simplicity 1-5757, Simplicity 1-5757SM, Simplicity 7-6497, Simplicity 7-6497SM. Snapper 1-5757, Snapper 7015757, Snapper 7015757YP. B66 Power King V Belt. Classical B66 Industrial V-Belt. B66 BANDO Power King V Belt. Classical B66 Industrial V-Belt. 21/32” (5/8”) Wide x 69” Length OC. Replaces Standard Raw Edge 5L690 FHP V-Belts. BX66 BANDO Power King V Belt. COGGED BX66 Industrial V-Belt. 21/32” (5/8”) Wide x 69” Length OC. Replaces Standard Raw Edge B66, 5L690 FHP V-Belts.